Melmoth over England, 1975. Photo by James Gilbert. The following article appeared in Harvard Magazine in 1990. For a long time I dreamed about flying. I would run in that slow, strenuous way of dreams, leaning farther and farther forward until my body, almost horizontal, was like a sprinter's coming off the blocks in a slow-motion film; and then with a final tremendous push I would become airborne and swoop, a stately great gliding bird, only a few feet above a terrain that undulated like the rumpled covers of my bed. 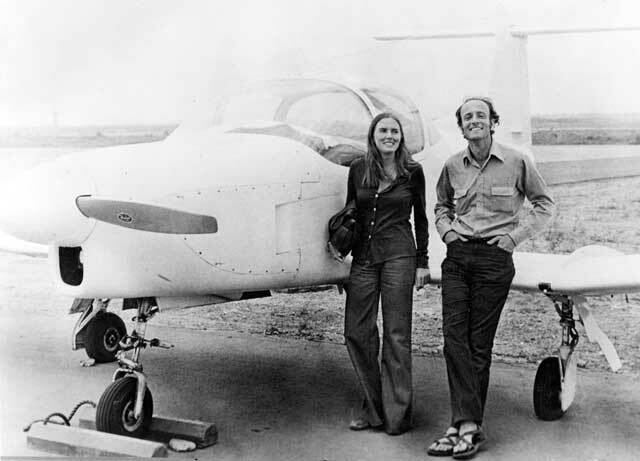 When he was 44 and I was 19 my father decided that the two of us, both private pilots of relatively slight experience, might fly around the world in two single-engine planes. It is easy to fall in love with such an idea, and I did. Obtaining the planes and corporate sponsorship proved to be too great a task even for my father's considerable promotional skills, however, and in the end we papered the walls of a room with the navigational charts he had bought for the trip. Back at college, I reverted during classes to my grammar-school habit of doodling airplanes -- no longer Sabres and MiGs -- on blue-lined paper. 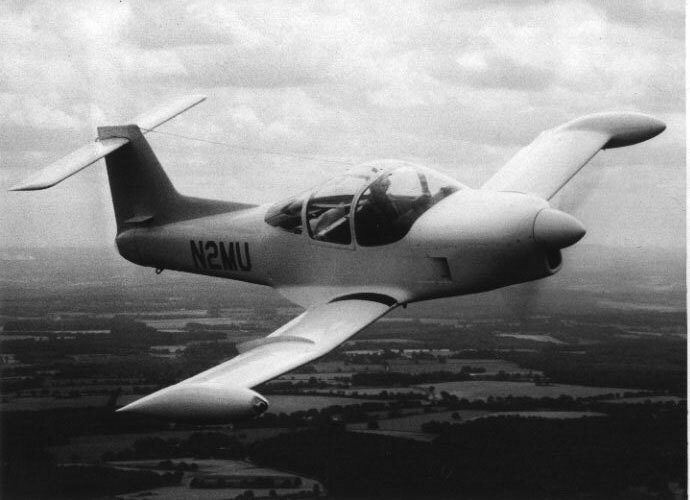 It was largely because of that idea of my father's that six years later, in 1968, I began to build a two-seat airplane with a range of 3,000 miles. The daydream of world flight had remained with me: a 3,000-mile range is sufficient to take you across any of the world's oceans, and therefore anywhere in the world. It was a project for which I was unprepared by either training or experience, and about which I felt in various ways divided. At times I would think that if I simply read enough books and asked the right people enough questions I could design as good a plane as anyone else. At others a different vision beset me: aeronautical engineering seemed a far vaster and subtler enterprise that anyone who had not studied it for years could imagine, and I was merely another deluded crank like the ones who spend their time on pet ornithopters or anti-gravity devices. Even when I was feeling confident in the feasibility of the project I worried that it might not be, in some grand Meaning-of-Life sense, worthwhile; but I could not have said (and this was part of my quandary) precisely what "worthwhile" meant. I made my living then, as I still do for the most part, writing magazine articles about flying. It was a trade that left me with a good deal of free time; and this I devoted wholly to the airplane. I worked four years on it, surrounded by citrus and rosemary in the back yard of a small house in Tarzana, California. I always believed I would be done in another six months, but deadline after deadline swept by like flotsam in a river as I cut and filed aluminum, drilled and riveted during the day, drew, erased, redrew at night. By the time it was ready to fly, I calculated that I had put ten thousand hours of work into the two-seat machine. It was about 21 feet long, and its wings spanned 23 feet. It had retractable landing gear, a 210-horsepower engine, and four fuel tanks with a total capacity of over 150 gallons. I christened it Melmoth, after the Byronic protagonist of the nineteenth-century novel Melmoth the Wanderer, who sells his soul to the devil for, among other valuable considerations, the ability to travel about at will in space and time. On September 6, 1973, without, so far as I know, divine or diabolic intervention, Melmoth climbed into the air from a long desert airstrip near Los Angeles. It was a real airplane after all, and I was not, at least for the time being, a crank. At about the time that I started building the airplane I also began living with a certain Nancy Salter, who is afraid of flying. She loves to travel, however; and so she would summon all her self-discipline to crawl into the various private planes, some of them quite old and rickety, that I would borrow and rent for trips while Melmoth was not yet finished, subsequently to write articles about the airplanes or the places we went or what befell us along the way. I tried to teach her to handle airplanes; it is thought to be therapeutic for those who fear them. She was fine so long as the airplane remained of its own accord on an even keel; but as soon as the wings departed from the horizontal her hands would leap from the control yoke to her face, never to return. In 1974 we flew Melmoth to Guatemala. We still used parachutes for seat-cushions then, and the interior of the plane was rough, with bare aluminum ribs and festoons of wires and rubber tubes held in place with gray tape. I had no navigational radios -- they cost money -- but had borrowed a friend's communications radio and jury-rigged it under the instrument panel for the trip. We crossed the Caribbean from Key West, skirting Cuba and coming down through the Yucatan to a tiny border post beside whose grass runway we were greeted by a mirthless teenager shouldering a machine gun. From there we hopped across the jungle -- which is utterly trackless -- to the ruins at Tikal. We left Tikal two days later for Flores in Peten province, a town on an island in a large lake; and the following afternoon, unprovided with a weather report, we embarked for Guatemala City. The capital is ringed with mountains; thunderstorms build over them every afternoon, as any pilot who has flown for more than a couple of days in the tropics knows. I hadn't, and didn't. By the time we got to the mountains, the barrier was impenetrable. We deviated more and more to the west, searching for a passage. I did not have an aviation chart of the area, only a Shell road map -- ah, youth! -- but both are equally useless when you have no navigational radio equipment and there are neither roads nor hills nor towns nor mountains below you from which to get your bearings. Only jungle slid beneath our wings, and the indistinguishable scrawls of winding brown rivers. As the afternoon wore on and the sun sank lower it became evident that we had covered two or three hundred meandering miles and now were lost; furthermore, our fuel would soon be running low. I shouted our situation to Nancy over the din of the motor. We conducted a tense discussion of our options; she was not feeling very well disposed toward me at that moment. She thought we should land the airplane on a sandbar in one of the rivers; we would certainly survive, and someone would eventually find us from the air. Loath to consign my newborn to the jungle -- once in, it obviously would never come back out -- I thought we should continue looking for a town or landmark, or perhaps just head blindly for the Atlantic or Pacific coast. After all, we had parachutes. If worse came to worst and we ran out of fuel, we could always bail out of the airplane. Nancy was not so intrigued as I was by the idea of parachuting in total darkness into the Central American rain forest. I drew on my road map a curved line representing my best wild guess about the track we had followed; the end of this line would be our present position. Then I drew another line, this time straight, from there back to Flores, and with a little protractor, the kind high school students use, I measured its bearing to the lines of longitude and reined the airplane around. Now everything was reduced to the number trembling beneath the index of the compass. I throttled back to conserve fuel, and we droned along toward the northeast and the evening. Clouds were beginning to form in a layer beneath us, obstructing our view of the ground. Nancy rested her head against the window and closed her eyes. After we had flown dead straight for more than an hour in air blue-gray with the tropical twilight, I was amazed, as I strained to make out details through the mist ahead, to see a steel-colored patch -- lake, island! It was Flores, precisely on our nose. As time passed I identified myself increasingly with the airplane. When you talk with controllers you use the airplane's "call sign," a series of letters and numbers which always begins with 'N' for US-registered aircraft. Melmoth was N2MU: November Two Mike Uniform in pilots' phonetic alphabet, and simply Two Mike Uniform once the first call had gotten the otiose November out of the way. After a while, without thinking much about it, I answered to the name "Two Mike Uniform" as readily as to the one my parents had given me. By an inner process of assimilation perhaps resembling that by which a wife and husband come to resemble one another, I assumed the qualities of the airplane and it mine. I always felt invincible in Melmoth. To my eyes the airplane was beautiful, and I knew it was lucky. I could not imagine coming to any harm in it. We piled hours on the tiny meter on its panel, landing on dirt strips in Mexico, slogging through rain and ice in the Northeast, flying blind and at night, always with the same conviction of privilege and invulnerability. After emerging unharmed from the Central American shakedown cruise I looked around for a more challenging project; inevitably, I hit upon the Lindberghian one. The Atlantic Ocean can be crossed by air in several different ways. One can hop from Labrador to Greenland to Iceland to Great Britain -- this route is within the range of some private planes even without extra tankage. From Newfoundland to the Azores is only 1,400 miles or so. Lindbergh, at the other extreme, had flown from New York all the way to Paris; only half that distance was actually over open ocean. The route I chose -- which I felt entailed truly "crossing the Atlantic" and not island-hopping or portaging about its perimeter -- was from Gander, in Newfoundland, to Shannon, in Ireland, a distance of about 2,000 miles entirely over water, with no means of navigation other than the compass and the clock. I prepared for the task with great thoroughness, and felt a little diminished when the man from whom I rented a high-frequency radio for long-distance communication told me that ferry pilots found Europe simply by putting its initial in the middle of the compass window. The Canadian authorities in Moncton, New Brunswick, inspected our equipment and administered me a short quiz on ocean flying techniques which I somehow passed. Nancy reserved to the end the right to change planes; she would later say that the reason she didn't was either that it would have been too ironic if her airliner had gone down instead of my jalopy -- she had equally little faith in all airplanes, regardless of size or manufacturer -- or that if I had arrived without difficulty, she would always have regretted missing the grand adventure. The dawn of August 5, 1975, was foggy and wet at Gander. Melmoth had been completely filled with fuel for the first time the previous afternoon; the fuelers used a funnel because their nozzles, intended for DC-7s, were too big for the tank inlets. Less than an inch of the polished chrome piston of each gear leg showed, and as I stood in front of the airplane in contemplation, its wings appeared to sag. At 9:45 we were cleared for takeoff; the moment we left the runway we were in the clouds. Melmoth slowly ascended with its burden of almost half a ton of fuel, and at 4,500 feet we broke out on top of the clouds. We soon left the coastal stratus behind us, and in an hour there was nothing to see all around us but open water. Flying is not exactly an interesting activity; at least, it generally isn't, and pilots prefer it that way. It took just shy of eleven hours to cross the Atlantic -- eleven hours of vaguely tense immobility that recalled Samuel Johnson's description of a ship as a prison with the chance of drowning thrown in. Nancy alternately read Nana and slept; talking was always difficult in the plane, and we never did it for long. I busied myself with various chores: updating our -- highly speculative -- position on charts (we now had navigational radios, but out here there were no beacons for them to receive); reeling the 150-foot high-frequency antenna in and out to inform controllers, first in Newfoundland and later in Scotland, of our progress and continued presence among the living; studying the never-changing instrument panel; and staring out at the ocean and trying to imagine it and us in some common scale. It was big, the Atlantic -- not as big as the Mercator projection made it look, but big nonetheless -- and horribly dark and cold beneath its shining back surface. It was no less deadly than arsenic or fire. Yes, we had a life raft and all that; but it would not have saved us. We flitted above vast jaws. If anything at all had gone wrong with the plane, we would have slept that night among the nudibranchs. We cruised at 9,000 feet, but at mid-ocean we encountered some clouds with ice in them and descended to 3,000. Evening fell early -- we were flying against the sun -- and as we began to pick up the voices of Scots controllers on the short-range communications radios we plunged into a wall of clouds. Rain roared against the windshield -- swirling silver strands if I turned on the landing light -- and lightning winked in the distance. But we had emerged from the unknown. By some miracle we had arrived precisely at the imaginary "gate" through which Air Traffic Control expected us to enter British airspace. We bored through the storm toward Shannon, and as we crossed the coast the clouds broke up and the clear dark countryside lay below with its pinpoints of porchlight, the swinging headlight beams of cars, and the blinking green-and-white beacon of the airport. It was a heavenly feeling to shut off the engine, to see the prop stumble to a halt and hear only the faint soft whir of the freewheeling gyros; to step out of the plane into a strangely balmy evening; to ride the taxi to the hotel; to sip tea and nibble biscuits in its almost deserted pub, survivors -- incognito! -- of a gamble with a ghastly way to go. On July 3 of the following year, 1976, we took off early in the evening from the small settlement of Cold Bay, on the easternmost island of the Aleutian chain, bound for Japan. Few private planes make the trip; no homemade one ever had. Our departure was precipitate. Intending to stay overnight and leave in the morning, I learned from the weather briefer that a typhoon was heading this way from the central Pacific, and would cross the chain in twelve hours. It would bring awful weather and adverse winds; we must leave now, even though we had just completed a 5-hour flight from Anchorage and had been up since early in the morning. With difficulty we got the plane fueled; the necessary technician had already begun his bicentennial observances, and had to be coaxed out of a nearby saloon. It was now the magic hour of the northern day, when white shacks on a damp hillside come to resemble flakes of apricot and salmon scattered upon chocolate. Leaving the indigestible scene behind us, we climbed westward toward a darkness over which brooded a vast disk of cloud. This was our typhoon; the undamaged arc of its perimeter was crisp against the fading sky. So long as we kept it on our left, it would hurry us along with favorable winds. We traced the line of the Aleutians with their now jagged, now liquid names -- Unimak, Amlia, Adak, Shemya -- for once not fogbound, but sharply outlined silhouettes upon a gunmetal sea. It darkened; a little snow began to fall as we passed Adak, and when we crossed the beacon at Shemya, the end of the chain and our last land before Japan, the darkness was complete. There was no light anywhere. The clouds of the typhoon were above us, blocking moon and stars and the skyglow of the subarctic summer night; the ocean below was empty of ships or islands. I had counted on a short night, like the other nights of the week I had spent in Alaska before Nancy flew up from Los Angeles to join me and we embarked for Japan. I thought the light would help me stay awake. But now the muffling darkness seemed to stretch out as it does before the dead, and I gradually understood the error of my calculations. We were flying southwestward, fleeing from the sun; and at these latitudes the time zones were narrow. Every three hours we pushed the dawn another hour away. The flight plan called for holding a heading of about 250 degrees all the way from Shemya to a point a hundred miles or so off the Japanese coast, then turning sharply right and landing at a town called Kushiro on the eastern shore of Hokkaido, the northernmost of the main Japanese islands. The constant heading was the result of a fortuitous coincidence of the great circle route and the local magnetic variation; the dogleg was in honor of the Soviet Union, into whose airspace it was deemed unwise, even in those years before KAL 007, to stray. Nancy slept, except for a unique moment when I inadvertently let one of the four fuel tanks run dry and the engine went silent with surprising suddenness. I did all the things one does to stay awake: sang songs, grimaced, performed isometric exercises, pressed my fingernails into the backs of my hands. At first I was not afraid, but as the monotony protracted itself I began to think about the wind, and to wonder about the range of Japanese beacons should it carry us too far seaward. Strangely, the possibility that something might go wrong with the airplane didn't trouble me; it was the possibility that we might get lost -- lost in the sky -- that eroded my self-assurance. Hour after black hour; nothing else. The fuel gauges for the two tip tanks dipped to empty; a little at a time, the mains were now coming down. I was cheered by a conversation with Anchorage, not because of anything that was said but because it was so clear, like a phone chat with a nearby friend. Somewhere off the coast of Kamchatka I located a broadcast station with the Automatic Direction Finder. It was playing Chopin; he sounded as wan and faraway as if I were hearing him over time rather than space. The ADF needle pointed to the music; first off to the right and a little ahead, then abeam, then fading away behind us. After the half-way point I began to communicate with Tokyo. The connection was much worse -- high frequency communication is at the mercy of a thousand atmospheric sprites, mostly malicious -- and the controllers were bureaucratic, wanting frequent reports on our fuel state and unable to imagine that we had fifty gallons of fuel remaining, not fifty thousand pounds. An airliner tried to help; I could hear him saying, "He's a small airplane, very small." A Kafkaesque official came on to complain that I had not made proper arrangements concerning a "ground handling agent" at Kushiro -- the concept doesn't exist in America, and I had never understood what their letters about it meant. Finally they told me that I could not land at Kushiro, but must continue another 150 miles to Chitose, the airport of Sapporo at the southern edge of Hokkaido. After we had been in the air for 13 hours, the sky to our left began imperceptibly to brighten. Dawn, never so welcome, brought hopeful signs. To our right was a hazy coverlet of clouds which I assumed concealed the Soviet-held Kuriles. The air began to look brown; we must be close to an industrial country. We overtook a ship, southwestbound like us. On a hunch, I turned 50 degrees to the right. More time passed; then, finally, a coast: green fields, cultivated slopes. The needles on the instrument panel awoke, stretched, swung to the center of their dials. We were over Japan. We alit at Chitose after almost 15 hours in the air during which we had travelled 2,650 miles. Twenty-three gallons of fuel remained in the tanks -- enough to go another 500 miles. Three thousand was about right. Chitose, Japan. July 5, 1976. After we returned from Japan Melmoth began for the first time to show signs of age. First there was a string of alternator failures; then the crankshaft broke in flight over southern California. Later a magneto failed in Texas, and a piston ring broke somewhere between Denver and Oshkosh, Wisconsin. In spite of these problems we continued to fly everywhere, though we began to avoid night flying when we could. I modified the airplane considerably, increasing its wingspan and installing a turbocharger that allowed it to operate comfortably at 20,000 feet while we uncomfortably sucked oxygen and our dogs, who occasionally traveled with us, lost consciousness. Thanks to the turbocharger, Melmoth could now cruise at a very respectable 230 miles an hour at altitude; but each new complication brought new risks. Once the turbocharger plumbing sprang an oil leak, engulfing the engine cowling in smoke and sending me down in a desperate two-mile dive -- I thought the plane was on fire -- to land on a country road. I left Melmoth parked right on the median line, where I figured that it stood the least chance of being clipped by a passing car, and hitchhiked to a town. There I found a pilot who gave me new oil and the fittings I needed and drove me back to the plane. I finished fixing it as night fell, and a highway patrolman helped me push it onto the shoulder. I passed the night watching the stars. Few cars passed. Around eleven, farm workers, tending the sprinklers in the melon fields, brought me a souper of cantaloupe, crackers, and salsa. I took off for home at dawn. In 1980 we flew down through Mexico and Central America, arriving in South America at Quito and descending eventually as far south as the northern point of Chile where, suffering from digestive complaints and the presumably unrelated malaise induced by being in a police state, we turned back toward home. We crossed the Andes twice, cruising at 19,000 feet among the musical peaks -- Soray, Salcantay -- and peering down into the gorges of the Urubamba and upon the ruins of Machu Picchu. We dead-reckoned again for hours over jungle -- this time the Amazon headwaters of Peru, Ecuador, and Colombia -- hanging breathlessly upon the uncertain swings of the direction finder's needle and the occasional sight of tiny settlements situated unmistakeably at the confluence of rivers. Our first child Nicholas was born the next year. When he was four months old, in the middle of winter, we flew to Boston -- a routine trip. He sat on top of the baggage in a car seat, battered into sleep by the enveloping noise. But the South American trip was to be our last big one; in midsummer of 1982, Melmoth was demolished in a freak accident. A Cessna with engine trouble went out of control while attempting to land as I awaited takeoff clearance beside the runway, and careened through my airplane. Its seven-foot propeller missed me by a foot, but chopped most of Melmoth into scraps. I kept the remains for a year, and then, after salvaging what I could, sold the empty hulk to a metal dealer to be shipped to Taiwan and converted into heaven knows what. He paid me $54.30 for it. Melmoth is entombed in memory. We have two children now and much to do, and I rarely think about the old airplane, the 2,000 hours we spent in it, the 350,000 miles of prairie and ocean and mountain that slid beneath its white wings. Animals and men still live who heard it drone overhead and perhaps glanced upward; trees and stones remain that were once brushed by its shadow. They forget; but if I murmur the words "Two Mike Uniform" I can still feel the tremor of the roaring engine and sense the vast surrounding space of flight. I can resuscitate for a moment feeble shades of the fear and relief, the fine tension I would feel before flying and the lassitude afterward; and I can still taste the indefinable affection that filled me when, after hours of flying, with a final glance at the cooling airplane I slid shut the hangar door.